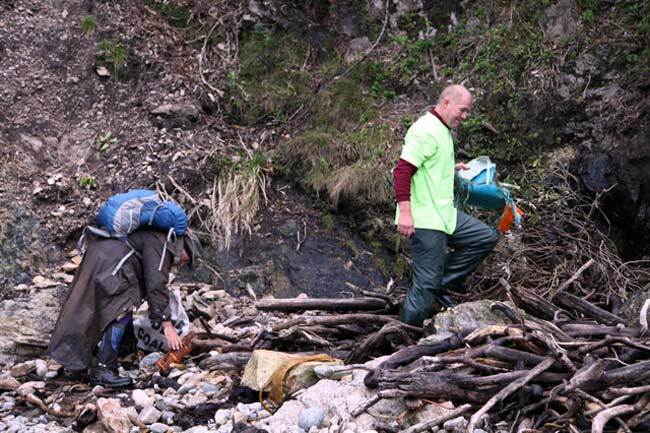 Recently I had the opportunity and honor of being part of a cleanup effort for South West Fiordland.. some of the remotest ruggedest, wildest and beyond words stunningly beautiful country in NZ. We worked in small helicopter transported teams covering an area from Resolution Island (Dusky Sound) around to Port Craig near Te Waewae bay on the south coast. Accomodation was generously provided by Kisbee Lodge in Preservation Inlet (Kisbee is a privately owned lodge which isn’t run on a commercial basis). 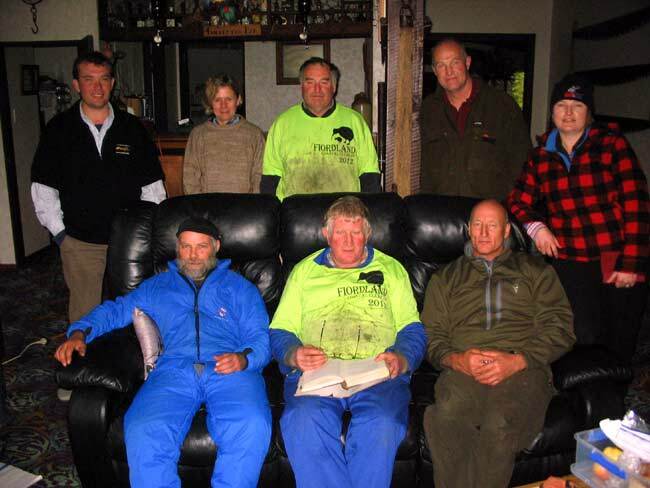 The team consisted of around 40 people mostly volunteers with 2 helicopters and 2 boats in support. My journey began in Queenstown where I drove to Manapouri to catch the helicopter over the southern alps to the wild west coast. Over the course of 4 days we collected roughly 120 fadges of rubbish (a fadge is basically a very very large sack thing) weighing roughly 150 kg a piece.. that’s a staggering 18000kg of rubbish!!! The cost of the cleanup has been estimated at over $100,000 and was sponsored by around 20 companies. One company (who do scenic flights) one of the primary motivations for involvement (additionally to genuinely caring for the place) was to reduce the visual impact of the rubbish along the coast, pre cleanup this impact was considerable. Although this was a mammoth effort and we worked our backsides off we couldn’t hope to get it all dispite our best efforts.. why? Some was buried too deep, some we undoubtably missed (you'd walk over an area and think you had everything then after turning around you'd see a lot more), some bits there was nowhere to land a helicopter and no chance to land a boat. 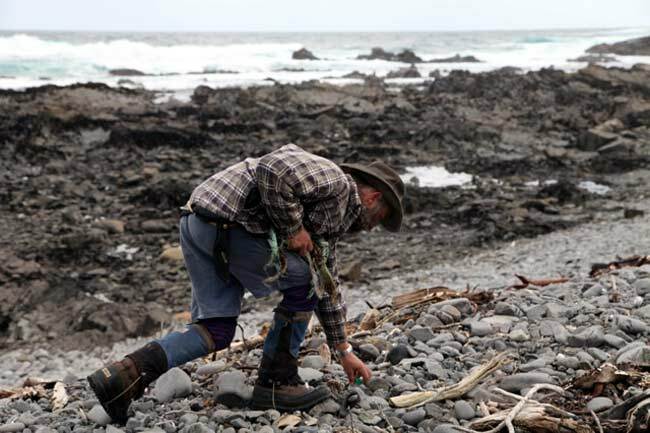 Some of the things left were being pounded by large swells.. remember we are talking about the Fiordland coast here... when its rough swell sizes are as big as anywhere in the world and as ropes, nets etc.. become tangled and buried in rocks and gravel. 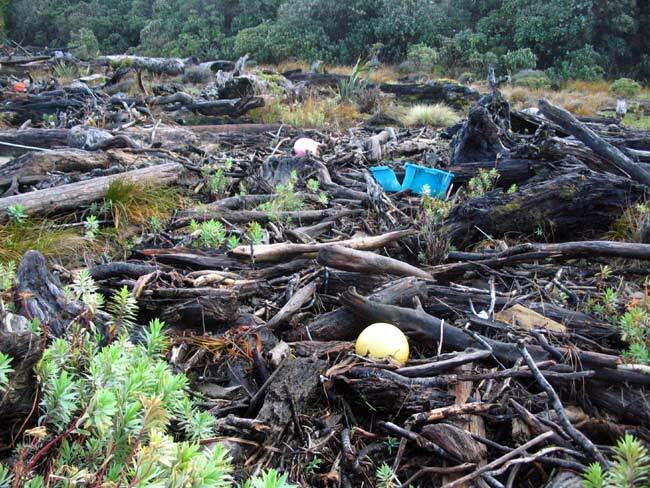 The debris isn’t limited to just plastics although they comprise the majority of the material. One team found a TV intact!! 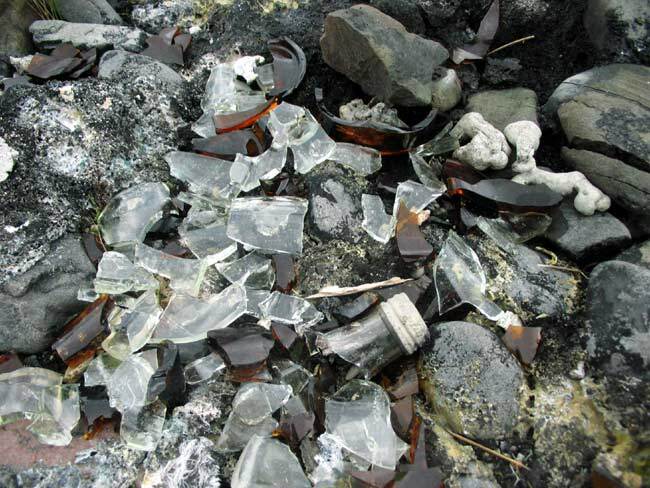 I found bottles of chemicals (some pretty nasty), glass, rubber, alloy and who knows what else was dragged off that coast. The fishing industry has lost a number of boats along this dangerous piece of coast with some whole & parts remaining unsalvageable. As much as I’d like to say the coast is now clean and clear.. I cant. We hadn’t the time or resources to get everything completely even though we did incredibly well and tried (to do so would have probably doubled the amount of time and cost of the operation, something I’d personally have loved, but the sponsors would’ve perhaps struggled? And perhaps the laws of diminishing returns). So what sort of stuff did we miss? A heartbreaking example is the burnt pile of rubbish from a campfire below. The plastic and alloy is fused into the beach making complete removal virtually impossible. The campfire melted mess, there is absolutely no need for this. Mr Wiffie a couple of meters from the fire remains.. likely died of natural causes. Other pollutants of this coast are things like Gorse and Broom and the odd Thistle.. all introduced species, they don’t have a strong hold on the coast as yet but they are about.. to remove them was outside of the scope of our cleanup operation. I’d hope that the Department of Conservation is managing to mostly stay on top of them, left unattended these invaders among others will do considerable damage to the area, something which cannot be allowed. So where did all this rubbish come from? Some I identified as probably foreign fishing boats (Korean writing on drink bottles etc..), much of it was rope, fishing buoys and fish cases from the local fishing industry. It should be noted that we had local commercial crayfishermen assisting with the cleanup effort. To the credit of the local commercial fishermen, they voluntarily have reduced their quotas by 20% to help preserve the fishery and marine ecosystems. 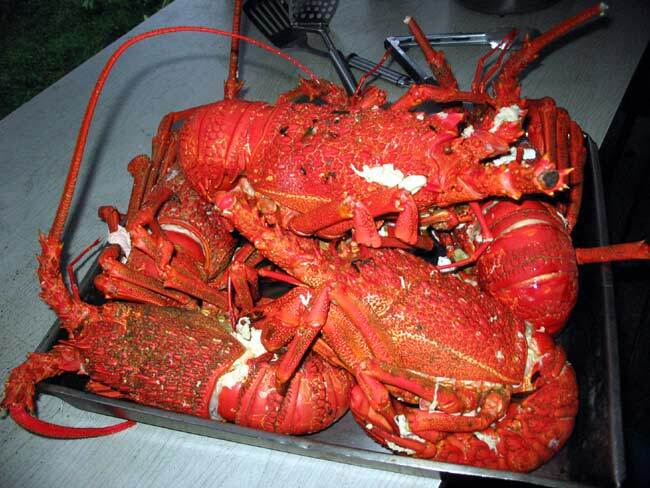 On such a rough coast ravaged by storm and sea fishing gear is frequently and unavoidably lost, fish cases washed from the decks of small boats. These guys are fishing close in shore amongst the bricks (rocks), ropes are chafed and broken off in storms. Although they try to prevent such losses they are unavoidable the local fishing community is more than happy to fully support and help with the cleanup operations. Some of the rubbish I was unable to identify a source.. it floats in from around the world.. previously there have been coconuts found on the Fiordland coastline (too cold to grow here though) which gives you some idea just how far this stuff floats around. The cleanup crew was divided roughly into 2 parts. Half started at Port Craig and worked westward, the remainder of us started on Resolution Island and worked south. Due to very rough weather I’m not sure how far the south team covered the first day. As for the western teams we covered 24 km the first dayI think I heard mentioned. We were in and out of the helicopter constantly, our crew divided into 2 teams of 3 and played leapfrog down the coast with the pilot assisting while waiting to ferry us to the next landing site & transporting boat based crews around. 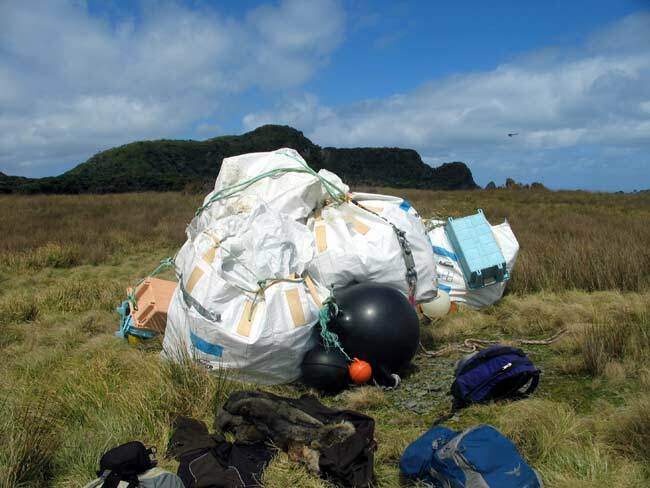 Regularly during the cleanup I was able to fill a sack with rubbish with in a few meters, we were forever having trouble keeping up the supply of empty sacks and resorted to dragging stuff, filling any fish cases, nets etc anything we could find that would hold stuff. More often than not we’d simply make piles for the helicopter to drop us yet another fadge on. Jim (Skyline Enterprises) & Rob (Local Fisherman (boat The Loyal)) picking rubbish off the shoreline. This was a serious job dependant on the particular piece of coast you were working, thankfully most of the stuff was plastic so not too heavy to move. At the end of the first day we were flown to Preservation Lodge in Kisbee Bay. The lodge the only settlement that remains on the site of the township of Cromarty an old gold mining town where gold was discovered in approximately 1868, at one stage there was around 100 miners in the area. In 1869 the lighthouse was built on Puysegur Point. 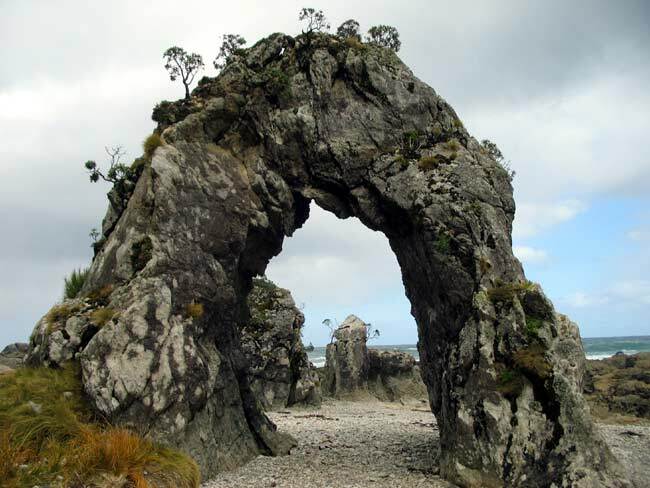 It’s also among the oldest settled area in NZ. 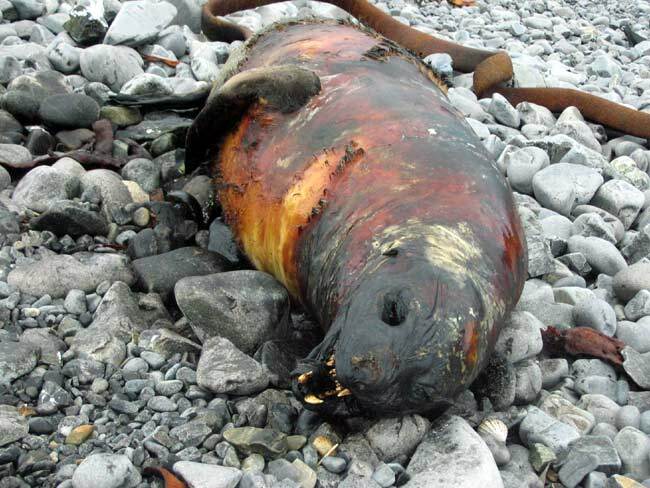 In the 1800’s sealers based in the area, soon afterward followed by whalers then the gold rush. Day 2 we were grounded by 70 knot south westerly winds and massive seas which made flying impossible and prevented the southern teams from joining us so 8 of us holed up in Kisbee dining on crayfish and wild venison, drinking beer & whiskey with more food than we knew what to do with. Day 3 up again at dawn after making lunches for the stranded southern teams (not as well provisioned as us) and back in the helicopter this time bound for the southern part of the coast and the toughest day. 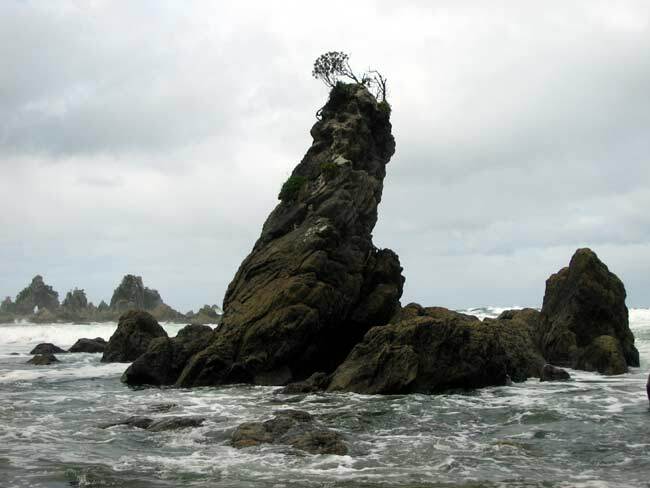 The geology of the coast is forever changing, every other landing site the rock and formations are quite different. 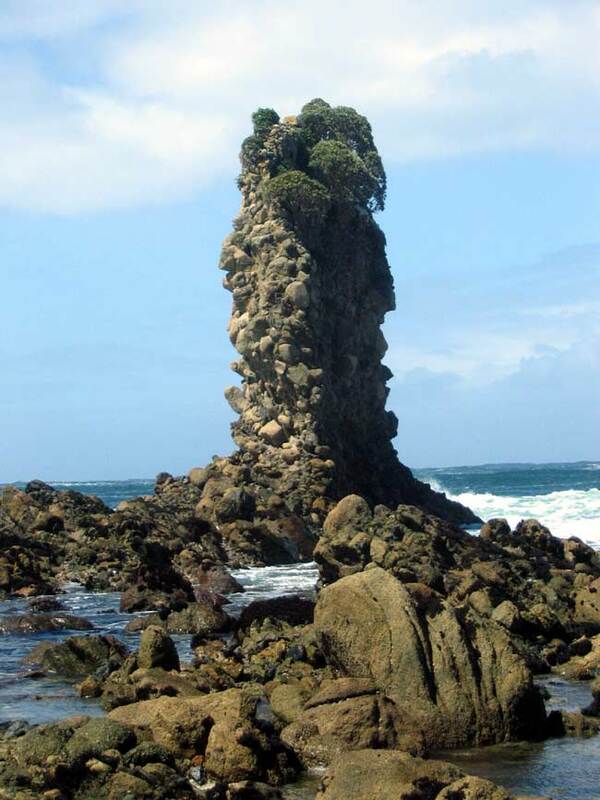 Pinacle on the west side of Resolution Island, most have a single tree on top, how they survive the storms is a wonder. Pinacle on the South coast. Shows bouldery formations, although you might expect most of these rocks to be loose most of the loose rocks have been thrown up on the shore frequently trapping debris. Yet another Tunnel, this piece of coast is covered in these kinds of formations.. they're everywhere. Frequently you think you cant get past a point and you find a tunnel through to the next beach. Tunnel to next beach, luckily the tide was out. 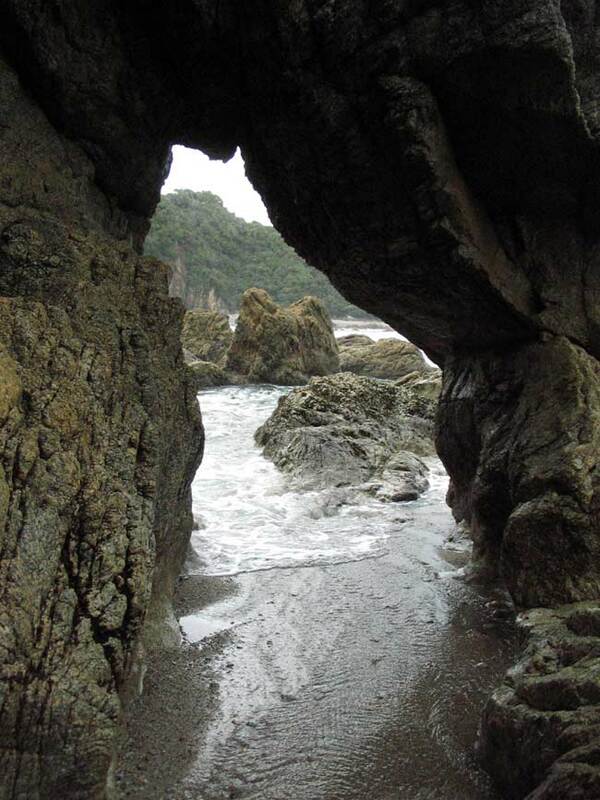 On the other side of this was a 3m drop to gravel with waves washing through, you had to carefully choose your timing to duck into a cave on the left then scramble around another bunch of rocks to get to the beach.. no problem dry feet. 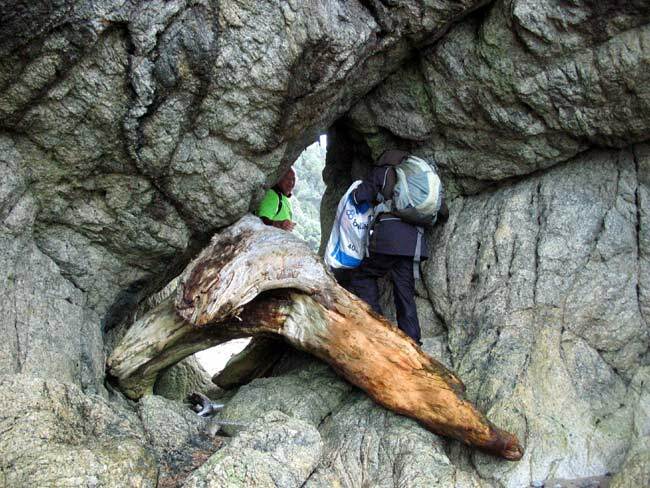 The main challenge presented by the southern part of the coast was that it is covered in boulders which move around with storms and trap stuff. At the end of day 3 we were back in Preservation Inlet. I should mention that as part of the team I was a member of we had a TV 3 cameraman and reporter, hopefully once it has gone to air (Campbell Live & Coast Watch) I will be able to include the footage supplementary to this article. Day 4 was mostly helicopter work moving fadges to the boats then the flight home. You have to give full credit to the chopper pilots doing this work.. they were flying in 35 knot winds with a sizeable ocean swell dropping the collected rubbish to the offshore boats as well as picking up boat based teams from the boats and ferrying back and forth to the shore. 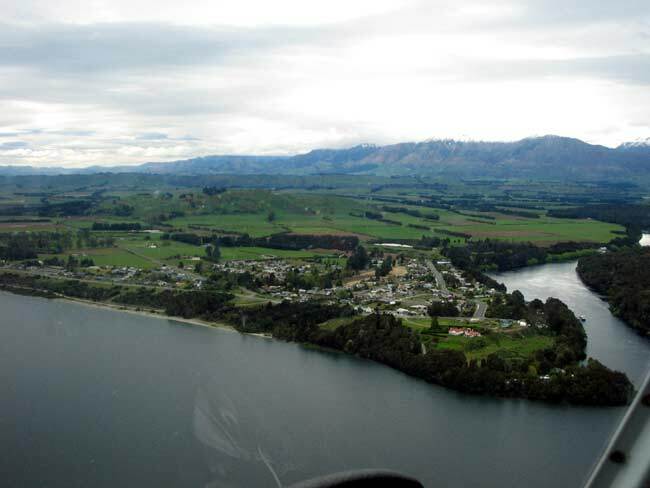 At the end of day 4 we flew back to Manapouri with southern teams heading out via boat (or Jetboat up the Wairaurahiri River to Lake Hauroko). We must preserve Fiordland regardless of the cost.. it is one of the Worlds most special places and one we still stand a chance keeping just that. 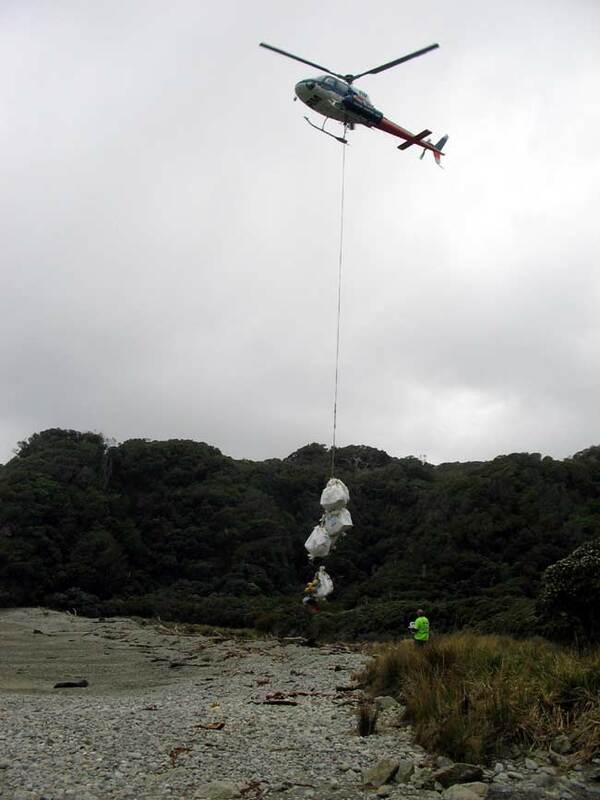 I'd like to take the opportunity to heartily thank all those involved with the Fiordland Coastal Cleanup 2012 you / we did a fantastic job a huge thanks to the pilots, sponsors, organisers and volunteers. If you would like to be involved with assisting "clickbelow.co.nz's "Project Pure" in its infancy as a sponsor or diving participant please contact the author to help me make an underwater cleanup dream a reality.. pollution isn't limited to the surface and is doing considerable damage to our waterways. Last dive in Lake Wakatipu hundreds of kg of rubbish was removed from just a small area.. this needs to happen in co-operation with local communities on a much more regular and larger scale. What I need to make this happen is support in the form of equipment supply / maintenance, air (breatheable), land based support and rubbish removal, experienced divers etc etc. Clickbelow's Project Pure has been stalled at the concept stage for several years as I cant do it solo or afford to fund the cost of the dives etc.. its time to make it happen before its too little too late.. & yes I'd like to see this project to go national and international. PADI run an annual cleanup dive in various locations around the world and remove a startling volume of rubbish, these dives however cover small areas and are just the tip of the iceburg.